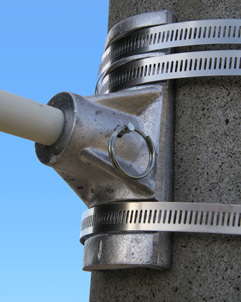 WindSAVER™ light pole banner brackets are ideal for pole banners up to 723 in height. Designed with small profile poles in mind, this system features a removable arm and is easily installed using our three band system. Parts list for WindSAVER Single Bracket. Parts list for WindSAVER Double Bracket.